t o o k a: t o o k a @ Charity Bazaar "RECOVERY NIPPON PROJECT"
t o o k a @ Charity Bazaar "RECOVERY NIPPON PROJECT"
The catastrophe in Japan on 11. March shocked all over the world. The situation is still critical and it will take long time until Japan will find back to normal life. We faced to the question, what can we do as Japanese living in foreign country. The concept of this project is to support Japan in a long term and not to forget this day. 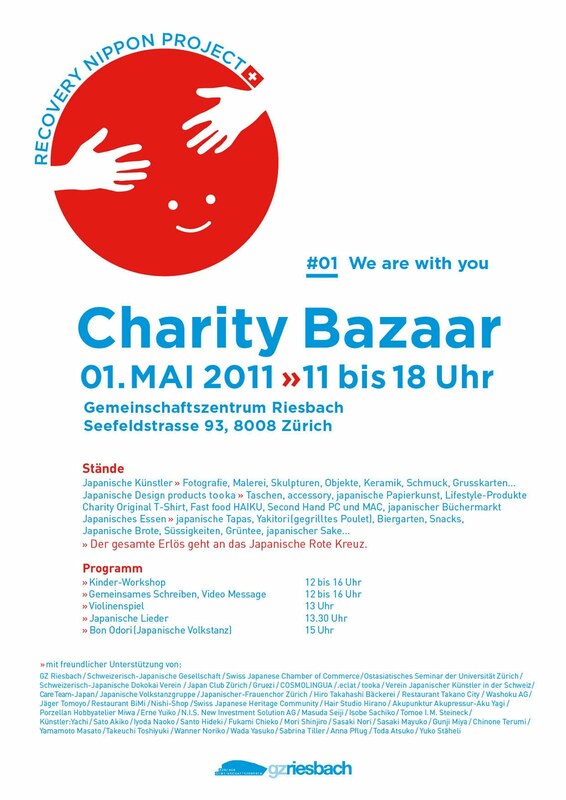 The first project will be a charity bazaar. More than 50 Japanese living in Switzerland will join this project and all the financial return will go to Japanese Red Cross Society. We are happy to have you on this day to think of Japan together.